The original "As seen on TV" Squeezewrench. The original “As seen on TV” Squeezewrench. 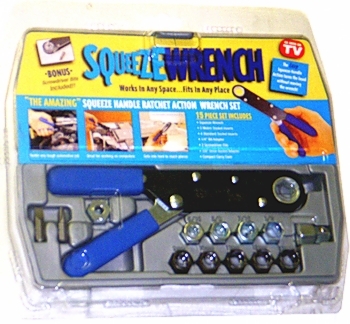 SqueezeWrench is a dual action ratchet wrench that requires no swing room, but delivers 45 degrees of turn with a single squeeze to drive nuts and bolts in impossible places. It also works like a conventional ratchet to loosen or snug down that nut or bolt. 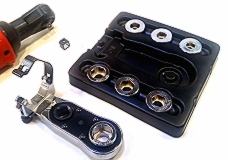 Fits 12 Metric and SAE sizes plus a 3/8 inch drive socket adaptor for use with all your own sockets. Includes a 1/4 inch hex drive bit adaptor to give you a 1 inch long screwdriver with the torque of a wrench. 1 flatblade & 1 phillips bit included. This is a good quality product and a terrific value item.CHRISTMAS SPECIAL PRICE!